I receive a lot of questions asking where do I buy my yarn from and what yarns do I like to use the most so I thought I would put together a short blog post about my yarn experiences, which I hope you find useful. I don't normally talk about the actual brands I use when I put together a crochet video tutorial because of advertising rules with YouTube, plus I don't like to give preferential treatment to certain brands, especially when I haven't tried all the amazing brands out there, but I will mention today a few of my secret favourite brands I always seem to go back to. If you have a yarn brand of your own that you would like me to try then I would be more than happy to do a written review. Just drop me a message. Fiber wise I do enjoy crocheting with natural products such as cotton and even bamboo because not only are they natural but they have a beautifully smooth finish which makes crocheting a pleasure, and are really good for beginners to use as well. I always go back to Rico Essentials Cotton DK, which is a lovely yarn to use and comes in some amazing bright colours. Some of the toys I have made with this yarn are still looking as good as they day I crocheted them although I haven't washed them yet so time will tell. Bamboo yarn, again very smooth and comes in some stunning colours. Just a pleasure to crochet with, but it is a little more expensive than the cotton. I am not perfect though and do still enjoy a good acrylic yarn as they do work so well with bigger projects like chunky cardigans or cowls. Budget wise they also do well especially the Stylecraft chunky acrylics such as their Special Chunky. It's cheap and still comes in some lovely shades. It is my weakness and I confess I do go to it every time when winter hits! I don't use a lot of wool based yarns in my projects as I consider it a luxury. That said it's hard to avoid merino or alpaca which can be super soft and not too scratchy or fluffy, but they can be expensive! I have however come a little addicted to the Sublime yarns by Sirdar, especially their Extra Fine Merino Wool. It is super super soft and squidgy so definitely worth the investment if you are making something that little bit extra special. I especially love the hot red shade around Christmas time. So they are my go to yarns to date, but where do I like to buy my yarns from. Well, it is a lot more common to purchase yarn online these days, but I have only ever used a couple of online companies myself as I still prefer to buy locally. Not only does this support local shops, but it also gives you a chance to check the colour and quality in person, just something you can't get when buying yarn online. I am also incredibly impatient and usually want my yarn today! but as you know it's not always easy to find a local yarn store and shopping online is definitely easier in theory. I don't like to specifically mention any online yarn companies to try as each experience is different, but I do find the team at LoveKnitting.com very friendly, and have happily ordered yarn from the WoolWarehouse.co.uk in the past, but that was a while ago. 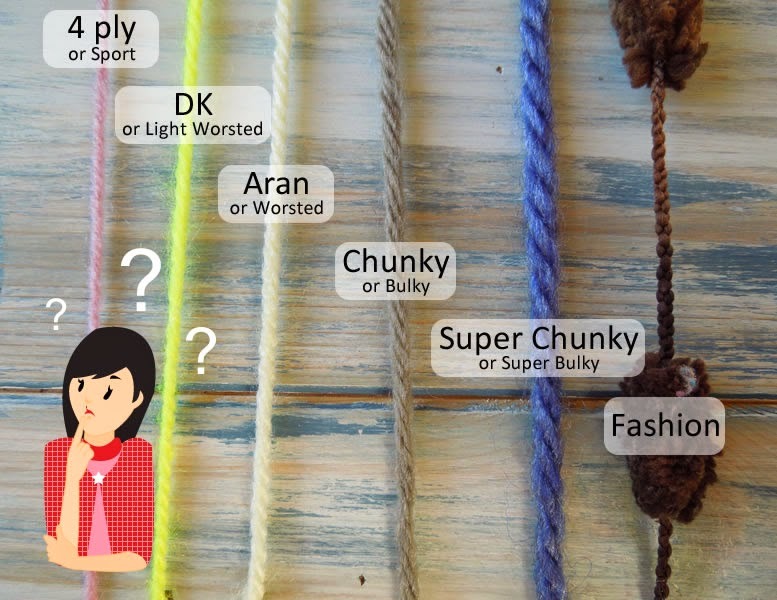 If you do plan to buy yarn online it is important that you check out what people are saying about them before buying. You can do this either via their Facebook page to see what other people are saying about purchasing from them or you can visit https://uk.trustpilot.com and type in the company name and see what reviews are being left about their yarns and customer service. This could save you a lot of heartache in the long run, especially if you have a deadline to keep to, or just want that yarn yesterday he he. Let me know your thoughts on what yarns you like to use and your favourite stores, and like I said if you have a yarn brand of your own you would like me to try or even want to mention one you'd like me to try just because you love it then just pop me a message or comment below! 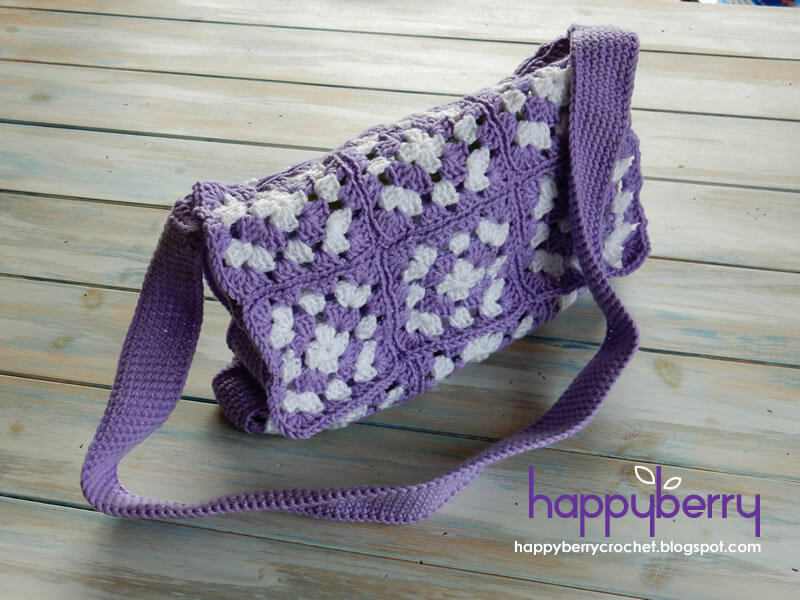 I loved designing this bag pattern because it is just so simple in construction! 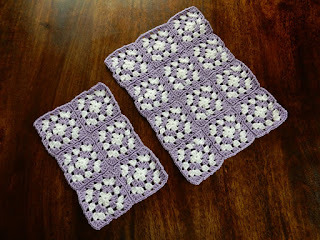 Perfect for beginners and for those who love making Granny Squares. You can apply this bag design to all sorts of Granny Squares as well, so hopefully this pattern will inspire your imagination. 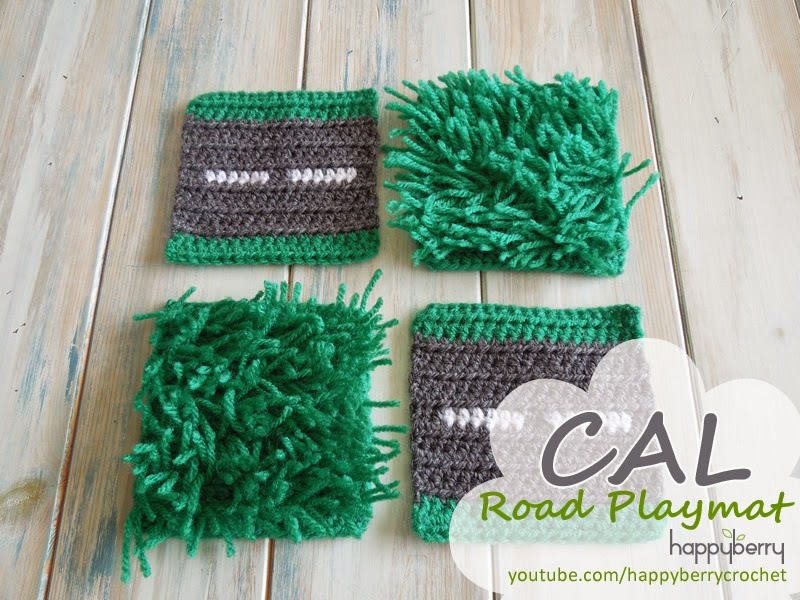 Make 18 measuring 8cm x 8cm (3.14" x 3.14") each approx. Continuing with P ch5, *3dc in next 2ch sp, ch2, [3dc, ch2, 3dc] in next 2ch sp, ch2, 3dc in next 2ch sp, ch2* rep from * to * twice more, 3dc in next 2ch sp, ch2, [3dc, ch2, 3dc] in next 2ch sp, ch2, 2dc in last 2ch sp, sl st in ch3 of your first 5 chs to finish. Fasten off and tie in all tails. Sew 6 of the squares together, and sew 12 of the squares together as shown in the photo on the right, to give you two pieces. One will be the back of the bag and the flap as one piece, and the smaller piece will be the front of your bag. You can choose how you join your squares, but I chose to sew them together using my purple yarn by placing the right sides together and sewing through the front loop of the front square facing me, and the back loop of the back square behind. This keeps the shape of the square nicely shown when completed. With right side facing up re-join P in one corner of your smaller 3x2 squared piece making sure your ready to crochet down the short edge and crochet 1sc in ea st down the shorter edge. 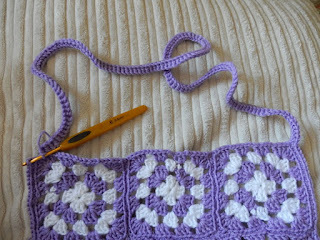 I again chose to only crochet into the back loops only so as to keep the shape of the square, but you can work through both loops as normal if you prefer. By the end of this row you should have 40 sc as each edge of each square has 20 sts. Now crochet 1sc in ea st along the longer edge across the bottom. By the end of this row you should have crocheted into 60 sts making a total of 100 sts so far. 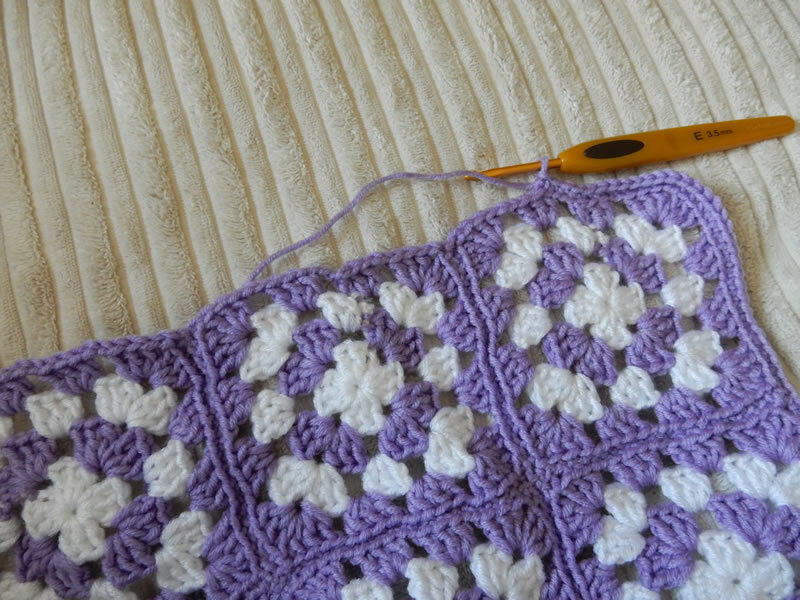 Lastly, crochet 1sc in ea st up the opposite shorter edge, adding another 40 sts to your stitch count. 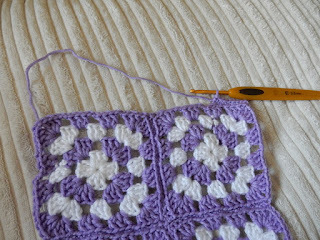 Don't crochet along the remaining longer edge, instead crochet 150 single crochet foundation sts, starting in the same st as your last sc. Then sl st in your very first sc to join the round. 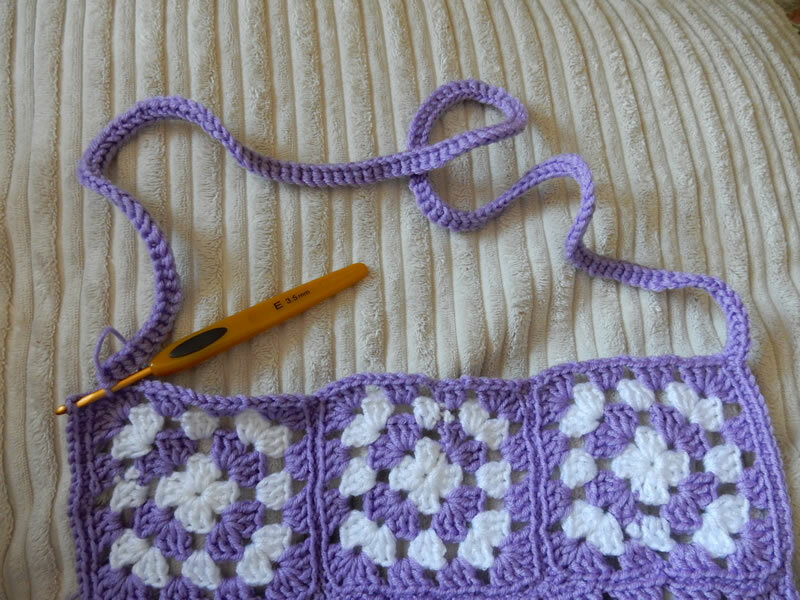 Ch1, and starting in the same st as your previous sl st, crochet 1sc in ea st around, going down the short edge, bottom edge and opposite short edge and across the foundation sts (strap) again, sk ch1, sl st in your first sc to join. Repeat for another 6 rounds until you are happy with the width of your strap, and the width of your bag. Now place your larger 3 x 4 squared piece underneath your project so far, making sure the wrong sides are together, as you want them to be on the inside of your bag, and put your hook through the same st as the one you just sl st into and into the top corner of the third square down on your back piece. Work 1 sl st into each st down the short edge, bottom edge and opposite edge, joining your front and back piece together as you go. Do not crochet along the strap this time, instead fasten off on the opposite side and tie in all tails. If you would like to add a lining to your bag to make it extra special then I highly recommend this brilliant photo step-by-step tutorial by FutureGirl. Click here. Stats as of 1st November 2015. Most of the time I don't pay attention to stats, but as I'm on track to hit 200,000 YouTube subscribers by the end of the year, with 181,000+ as of today, it's hard not to be astonished at the sheer size of my audience, and perhaps a little daunted! It has also come to my attention (courtesy of my husband who does enjoy stats) that I may, just may, now be the biggest British crochet YouTuber, and possibly the biggest UK craft channel? What is this craziness?? I even have more subscribers than British Vogue, which let's face it, is pretty awesome! And I only really started sharing tutorials in 2011, so I think that means I may also be the fastest growing crafty channel too! Of course it is only thanks to you guys. So as we near the end of 2015, I want to take this opportunity to say THANK YOU. Thank you for all your ongoing support, kind words, donations and messages. You help keep me motivated, inspired and of course designing! I will soon be recording my annual vlog talking about everything that has happened this year and what we can look forward to in 2016, so do look out for that. 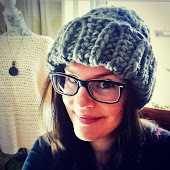 In the meantime, let's check out some other awesome craft and crochet channels from around the British countryside, starting with the beautiful Sarah-Jayne, a fellow British crochet designer and her channel. I hope you enjoy. 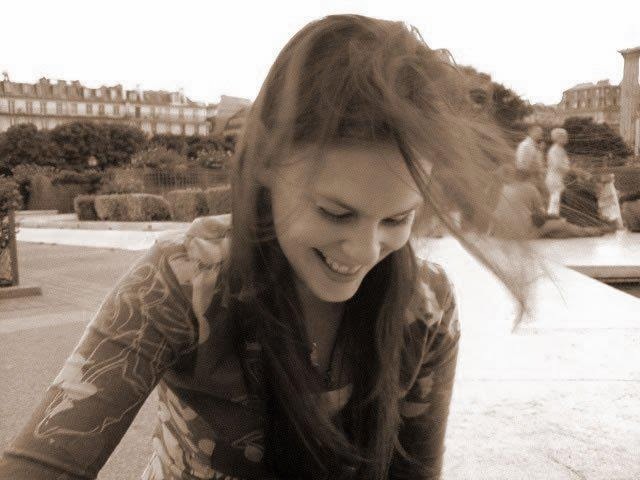 "My name is Sarah-Jayne, I make videos on the things I am passionate about- Life, Beauty, crafts, crochet. I upload a new video every Sunday so make sure you check back! :)"
"Welcome to The Crafts Channel, your online masterclass for crafting techniques. We have dozens of video demonstrations that are jam-packed with ideas and inspiration for you to try - all from the comfort of your own home! From wire work to felting, paper sculpting and polymer clay, we've got it covered." "Stampin' Up! UK Independent Demonstrator Sam Donald"
"We share easy, do-able, fun and colourful craft ideas for all ages. Craft with nature. Craft with recycled items. Crafts for all seasons. Crafts for all ages. Something for everyone. Learn a new skill. Practice your basic sewing. Learn to knit. Learn to weave. Take a peak and explore what we have in store for you. New videos every Monday and Thursday. " "Ever wanted to learn how to knit? Want to jump on the crochet trend? WATG are here to offer you the latest tutorials for on trend styles and techniques. From beginner's how to's to expert knitting techniques, we're here to help you become part of the gang. Wool And The Gang is a do it yourself and ready to wear fashion brand for women, men, kids and babies. Our do-it-yourself kits contain everything you need to get started with knitting. The ready-to-wear pieces are unique, they have been hand knitted by wonderful artisans in Peru." If you know of any other awesome and even bigger UK crafting channels then I would love to hear about them! Or if you are just starting out a channel too, then why not let me know in the comments below so I can check out your work and maybe I can feature you too!